Cirque du Soleil is thrilled to return to Grand Rapids, Michigan with its coolest arena show yet - CRYSTAL. This one of a kind arena production blends circus acts and the world of ice skating in a stunning production that will take the audience on a journey into a whimsical frozen playground where figure skating mingles with acrobatics and aerial feats. 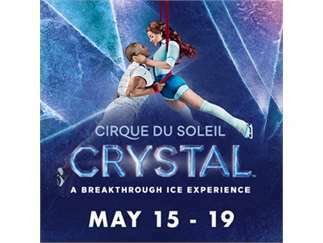 CRYSTAL will perfrom at Van Andel Arena from Wednesday, May 15 through Sunday, May 19, 2019 with seven performances. Directed by Shana Carroll and Sebastien Soldevila, Crystal, our misfit heroine, takes you on an exhilarating tale of self-discovery as she dives into a world of her own imagination. Feel the audience as she soars through this surreal world to become what she was always destined to be: confident, curious, and creative. CRYSTAL invites you to suspend reality and glide into a world that springs to colorful life and astounding visual projections and a soundtrack that seamlessly blends popular music with the signature sound of Cirque du Soleil. CRYSTAL is suitable for all ages.